At Siperstein Dermatology Group, we are committed to providing specialist care for our younger patients. Our certified dermatologists have a wealth of experience in pediatric dermatology and are qualified to treat a range of pediatric skin conditions, such as eczema, warts, molluscum, psoriasis and acne. We also perform full body examinations to check moles and birthmarks. Our team is known for a gentle bedside manner and child-friendly approach and will ensure that your child is as comfortable as possible. A number of skin conditions are particularly common in young children and adolescents and require specialist knowledge to diagnose and treat. For example, eczema is especially common in babies and younger children, and can cause great discomfort. Other conditions – such as certain types of birthmarks – may rapidly develop as a child grows older, making it desirable for evaluation and treatment to take place as soon as possible. Children who grow up in Florida are also likely to experience higher levels of sun exposure, so a consultation with a certified dermatologist to monitor mole development and receive advice on sun protection is always highly recommended. Eczema, also known as atopic dermatitis, is a condition which results in the inflammation of the skin. This is sometimes accompanied by asthma or hay fever. Children with eczema usually have dry, red, itchy patches on the skin. Eczema may last for a number of years but is usually outgrown by adulthood. Since eczema is a complex condition, a multi-faceted approach may be necessary for effective treatment. Phototherapy, corticosteroid creams, antihistamines and immunomodulators are some of the key treatments, which may alleviate the symptoms of eczema. It is normal for young children to have moles and birthmarks on their skin – in fact, the majority of children are born with at least one birthmark. Most birthmarks are benign, but some, such as hemangiomas (vascular birthmarks) may require treatment if they present in certain areas of the body. For peace of mind, it is best to have your child’s moles and birthmarks checked by a specialist, so that the type of birthmark can be identified and any complications addressed. Molluscum is a viral infection of the skin common in young children. It spreads through direct person-to-person contact or through contact with contaminated objects. It usually results in round, raised, skin-colored bumps appearing on the skin. The lesions may become red, itchy and inflamed. Molluscum is treated using cantharidin (beetle juice), liquid nitrogen, curetting or certain topical creams. We will have a comprehensive discussion with you and your child to choose the best approach. Psoriasis is a complex skin condition, which has a range of causes. Some patients are genetically predisposed to psoriasis, while others develop psoriasis due to certain triggers, such as strep infection or trauma. Psoriasis usually looks like red, itchy, scaly patches, commonly on elbows and knees. Phototherapy, excimer laser, topical creams and oral and injected medications are some of the key treatments available. Adolescent acne is by far one of the most common pediatric skin conditions. Acne develops when hair follicles in the skin become clogged with oil, dead skin cells and dirt, leading to inflammation. It can also be caused by hormone changes. Most teenagers develop some form of acne. Depending on the severity, acne may be treated with topical creams and washes, topical/oral antibiotics, and retinoid creams. Our goal is to take care of all your child’s dermatological needs so that you can have total peace of mind about his or her wellbeing. Our dermatologists are known for their comprehensive and up-to-date knowledge, providing exceptional patient support at all times. We do our best to make your child feel at ease during the visit, as establishing trust with your child is key to successful outcomes. 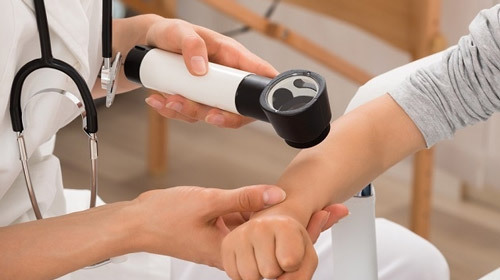 If your child is presenting symptoms of a skin condition, please book a consultation today so that we can provide your child with the necessary care.